Grown in dozens of varieties, each with its own distinct shape, color and growth requirements, small shrubs are hardy, long-lasting plants. Nestled in a container flanking a front porch, or grown along a front flowerbed, small shrubs are oftentimes hardy and drought-tolerant. Many shrubs are also evergreen, meaning they retain their foliage and color all year long. 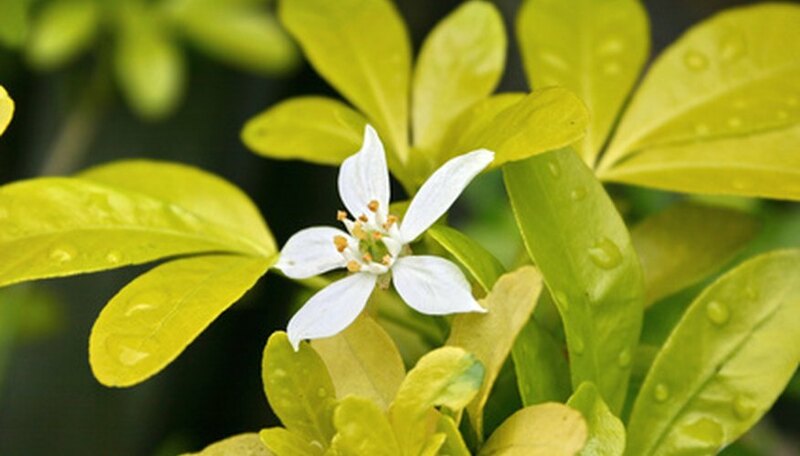 Their ability to withstand cold temperatures and a wide range of soil types makes for a versatile shrub variety. Wintergreen cotoneaster (Cotoneaster conspicuous) is a semi-evergreen shrub that grows 3 to 4 feet tall. Drought-tolerant, wintergreen cotoneaster tolerates a wide range of soil varieties, making for an adaptable, small shrub. The spreading form of the wintergreen cotoneaster is ideal growing along a front bed for a burst of color to the landscape. In spring, the small white flowers emerge to light up the landscape. The small, shiny, black and green leaves contrast with the simple flowers for a striking contrast. Wintergreen cotoneaster shrubs prefer full sun and well-drained, moist soils to thrive. The USDA Hardiness Zone for planting is 6 to 7. Green mountain Boxwood (Buxus sempervirens 'Green Mountain') is a low growing evergreen shrub that reaches on average 3 feet tall and wide and has a clumping growth habit. Deer-tolerant, green mountain boxwood has an upright oval shape and showy foliage that lights up the landscape with color. As an evergreen shrub, green mountain boxwood keeps its foliage and color all winter long. Providing color to the dreary, winter landscape, green mountain boxwood is ideal tucked into containers or grown along a front flowerbed. Green mountain boxwood prefers full sun and to part shade to thrive. Cold hardy, green mountain boxwood has small flowers that emerge in spring. The zone for planting is 6 to 8. William Penn barberry (Berberis x gladwynensis 'William Penn') has a moderate growth rate and medium texture. The dense, mounding form and low-growing nature makes this barberry an ideal small landscape shrub to grow around the garden. Growing 3 to 4 feet tall and 3 to 5 feet wide, William Penn barberry shrubs have dark green, lustrous leaves that turn bronze in the winter. The yellow flowers on William Penn barberry bloom in spring for a bright burst of color. Drought-tolerant, the showy foliage on this barberry makes for a striking shrub. The zone for planting is 5 to 8.